Our personalized mint tin is a sophisticated and unique way to remind your guests of the lovely time they had at your baby shower or baby event! Personalized mint tins are a trendy favor to give this season. Hot, hot, hot! This adorable design always makes me smile! Perfect for the mom to be having a baby boy. Colorful baby boy blue toys -each one cuter than the next - are specially designed on this personalized label. 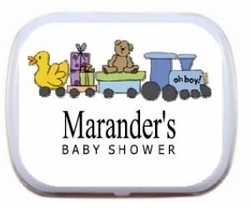 Choo-choo trains, duckys and teddy bears make this personalized mint tin feel even more personalized! Choose the text of your choice, candy and mint tin color. Each personalized mint tin is designed with a hinged closure, topped with a personalized label and individually shrink wrapped around the edges of each mint tin. Each palm sized mint tin measures 2.25" x 1.75" x .5" (but are also available in the Altoid mint tin size which is 3.75" x 2.5" x .75"). Choose your favorite candy choice and mint tin color.